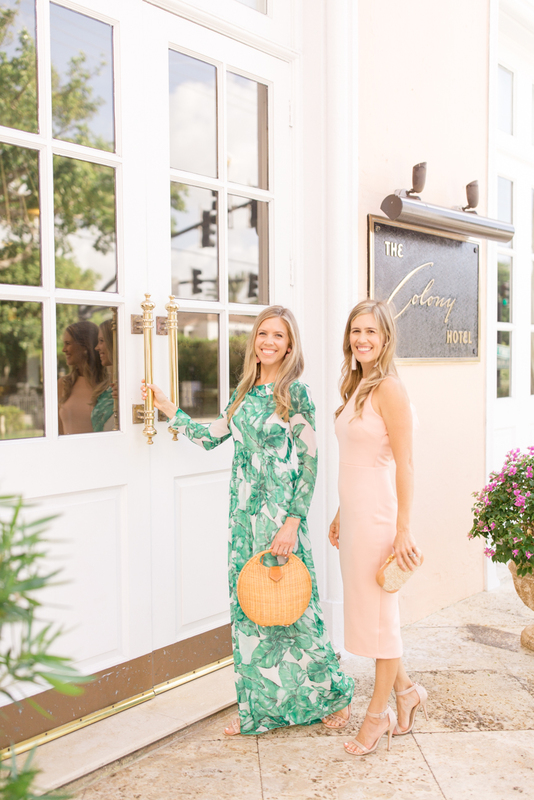 We recently had the best time staying the night at one of our favorite local boutique hotels, The Colony! 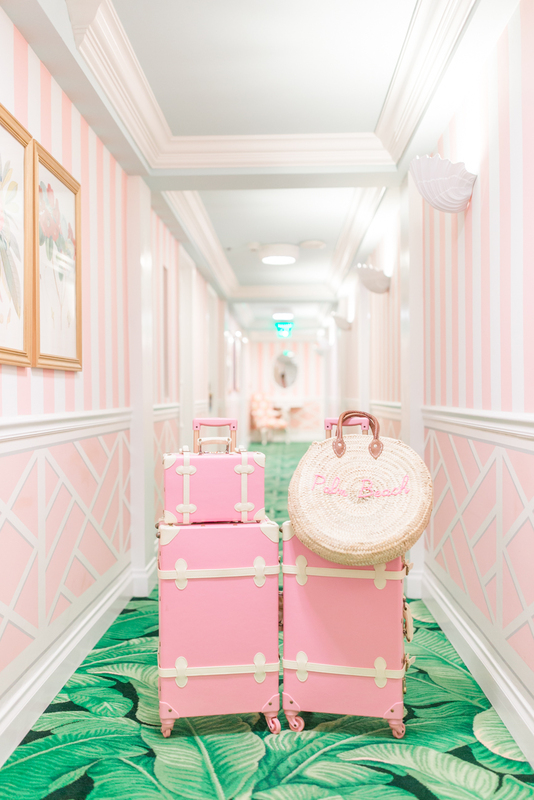 We have been there many times to eat, play and even celebrate Beth’s Baby Shower a couple years ago, but this was actually our first time staying there. 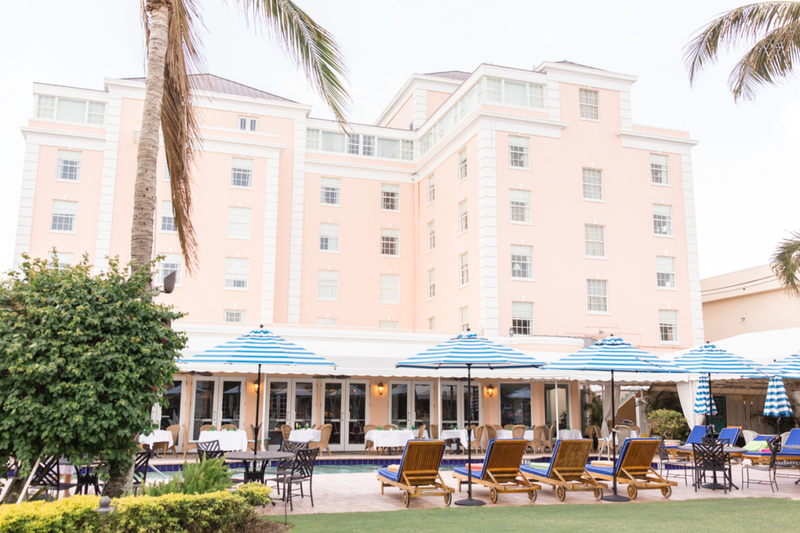 It’s a real gem here on the island, and we are excited to share everything we love about it with you today! 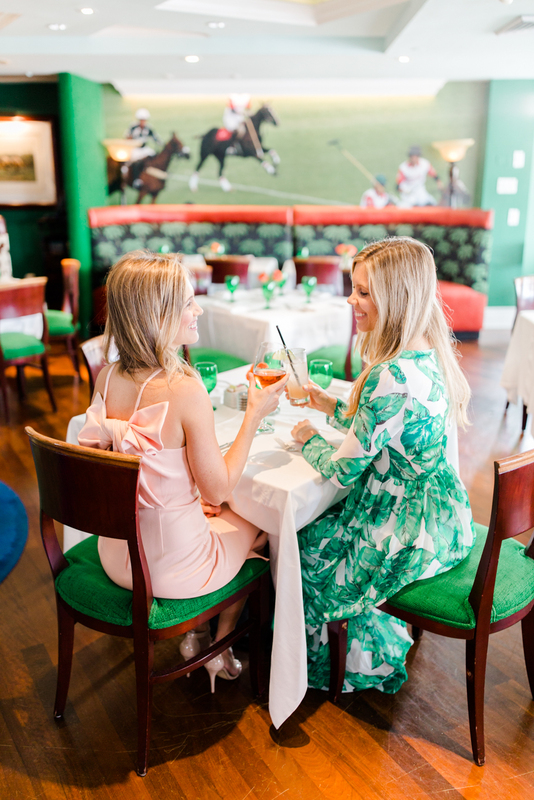 The Colony is located one block from Palm Beach’s iconic Worth Avenue and two blocks from the beach and has been a staple here since 1947. 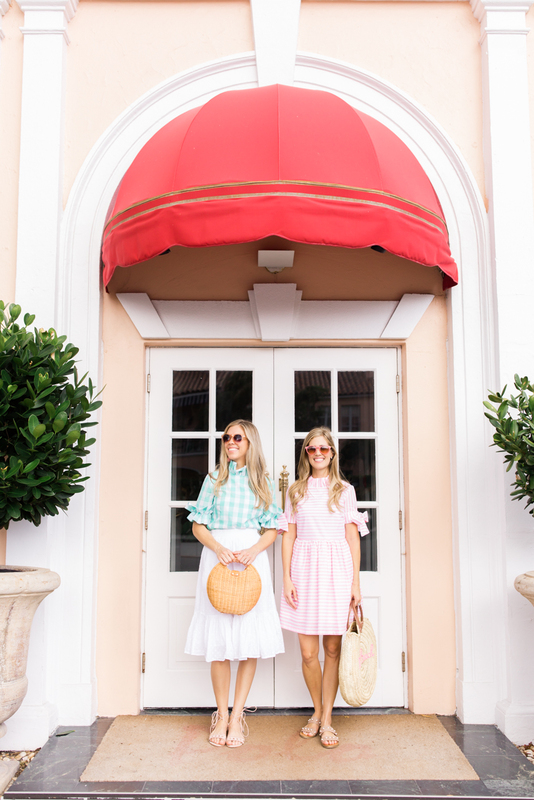 We feel right at home here thanks to the exterior’s perfect Palm Beach pink and the lobby’s pastel hues and playful banana leaf prints. 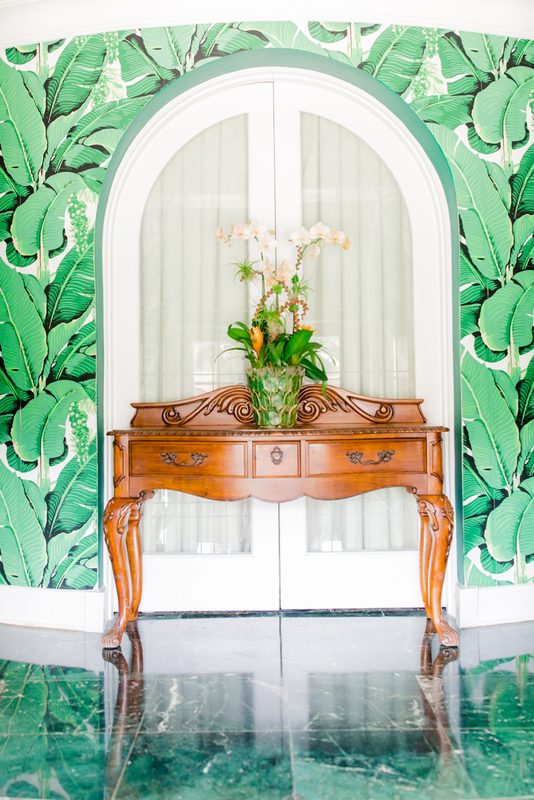 Carleton Varney decorated the lobby and hotel rooms with his signature vibrant style and each room is one-of-a-kind. 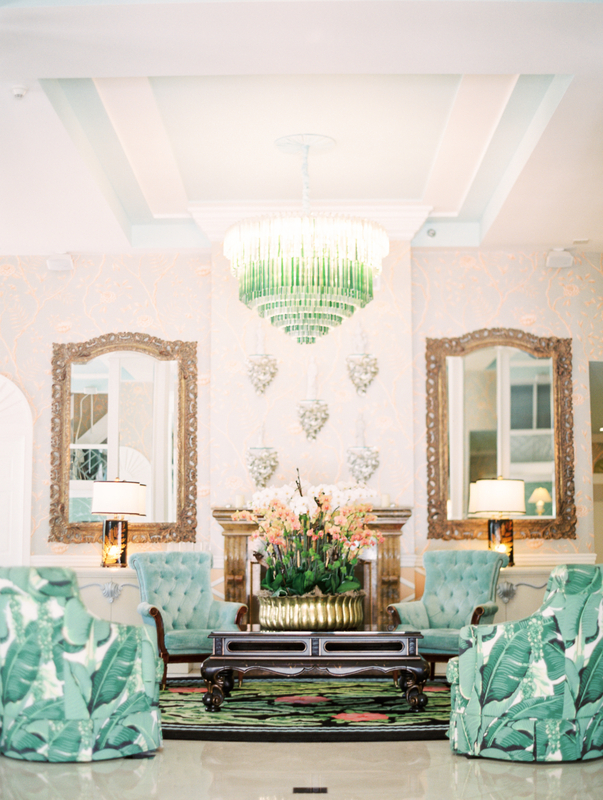 The Colony definitely feels more like a grand estate than a hotel, and we were completely in heaven staying the night in the Presidential Suite! 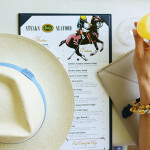 After checking into the hotel that afternoon, we went exploring for a bit before having dinner at their popular restaurant, Polo. 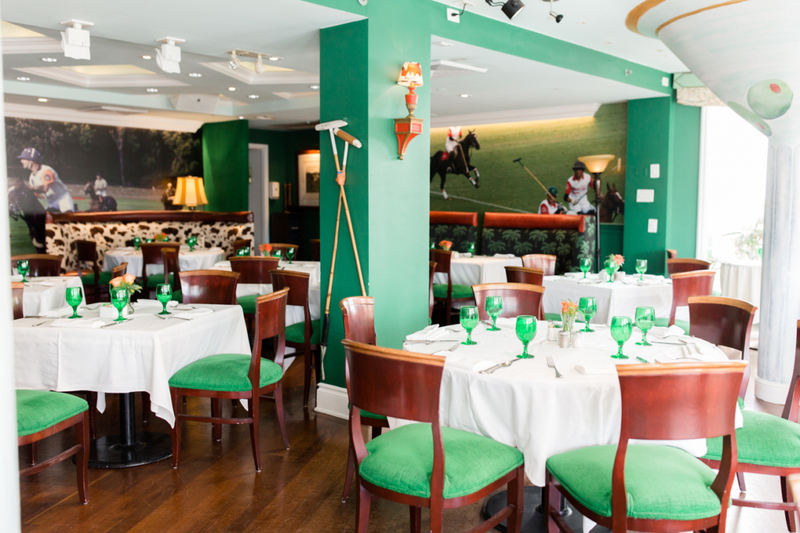 The restaurant features murals of polo matches, dark wood and an emerald green hue and is well known for their Motown Friday Nights. 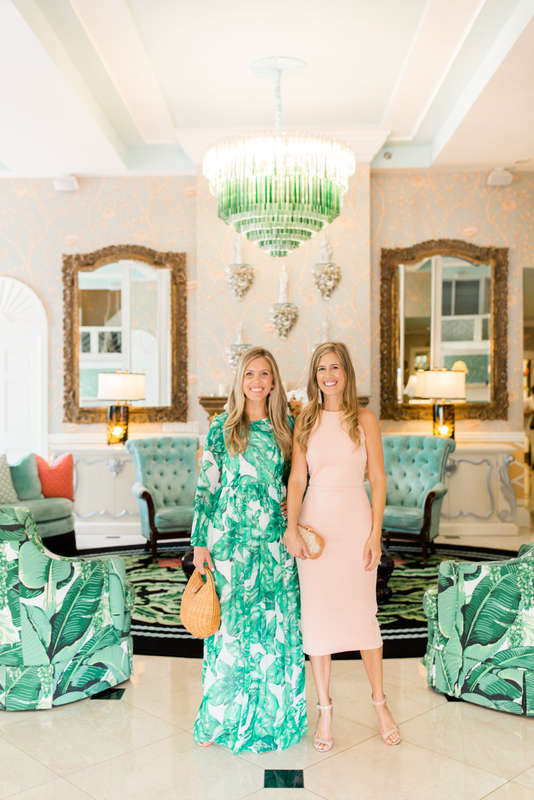 That night, we savored a delicious chicken and pasta special and then headed back to the luxurious two bedroom suite to peek around at all the fantastic decor before falling asleep! 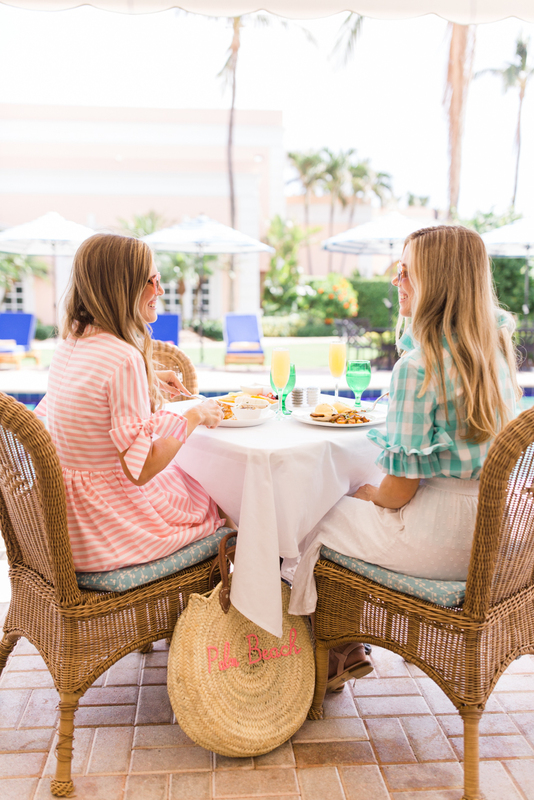 The next morning, we headed back to Polo for a yummy breakfast on their outdoor terrace. 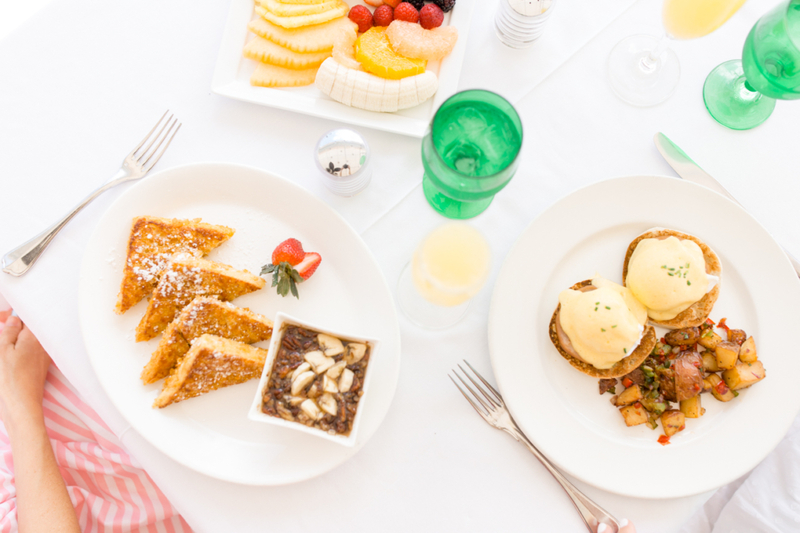 Their menu is full of delicious options, and we enjoyed the french toast and eggs benedict with a side of fresh fruit. 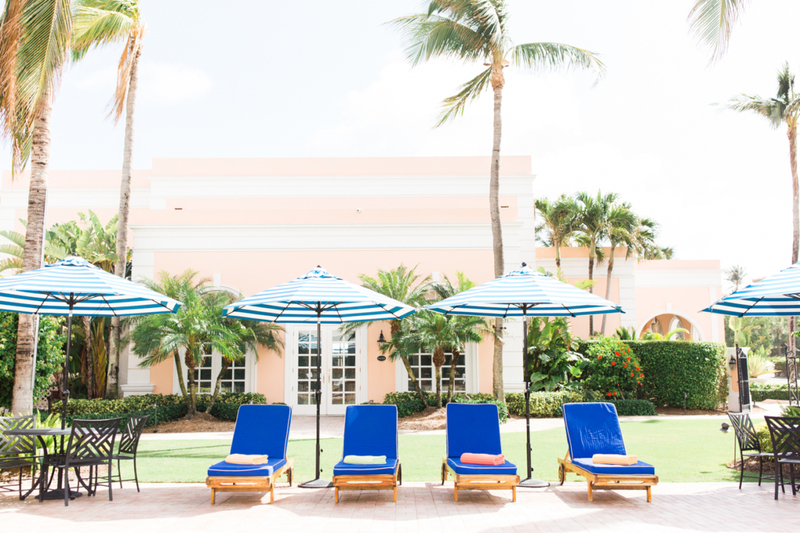 We also love their Bimini Bar that is located just off the pool. 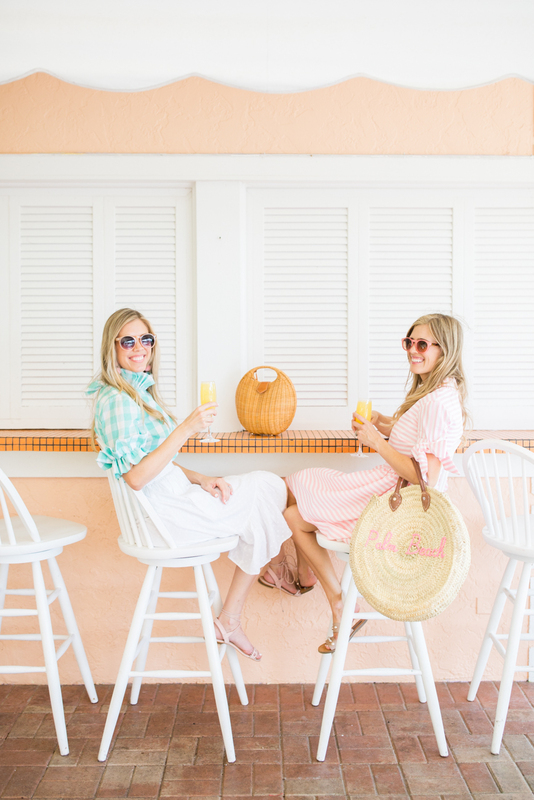 It is the perfect quaint place to sit back, relax and sip on a mimosa while you people watch! 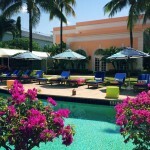 The Polo restaurant also overlooks their backyard oasis with palm trees and a private pool. 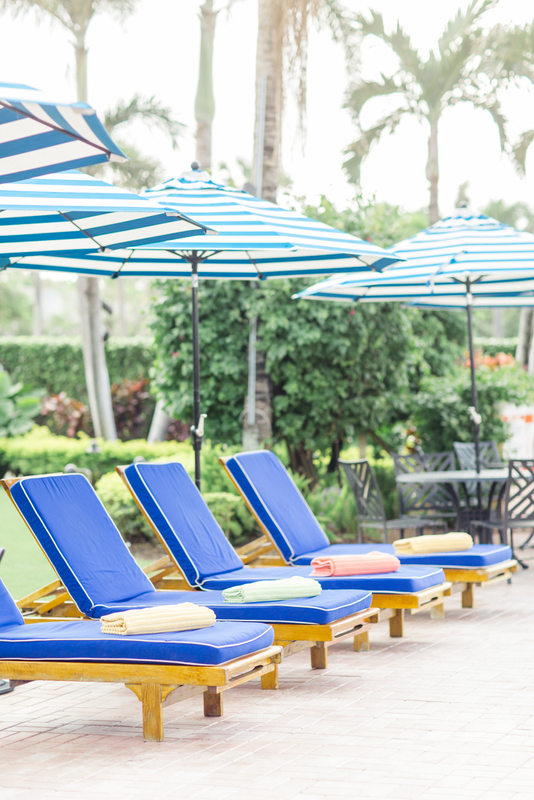 The cabana striped umbrellas and blue lounge chairs are so inviting to rest, read a book and even doze off in the sun. After soaking it all in, it was sadly time to go. But we left feeling refreshed and so thankful that we live nearby so we can pop in again soon! 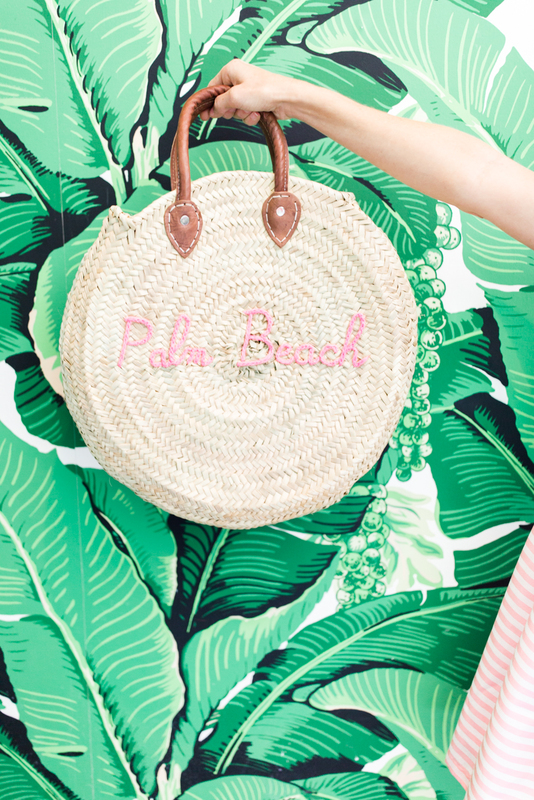 PS For more ideas of what to do in Palm Beach, don’t miss our new Guide to Palm Beach! 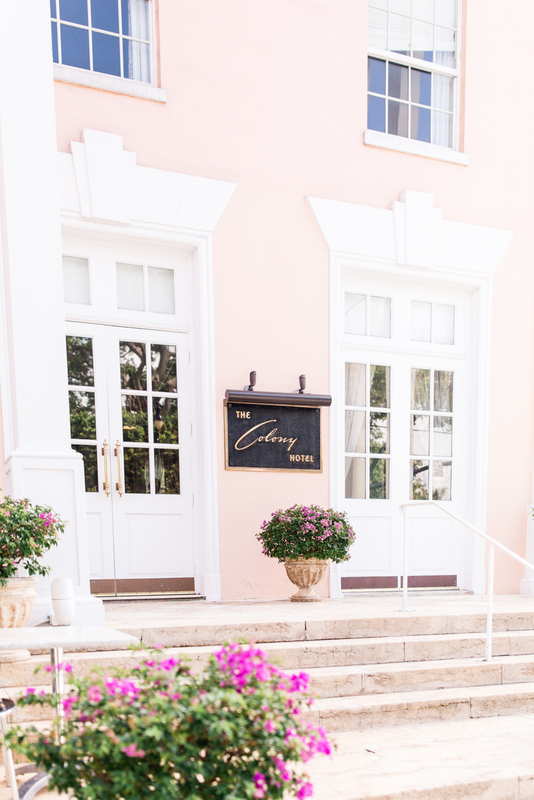 *Thank you to The Colony for partnering with us on this post!